How many of you associate apple orchards and fruit farms with Northern Wisconsin? Or do you think we’re covered in snow all year round? 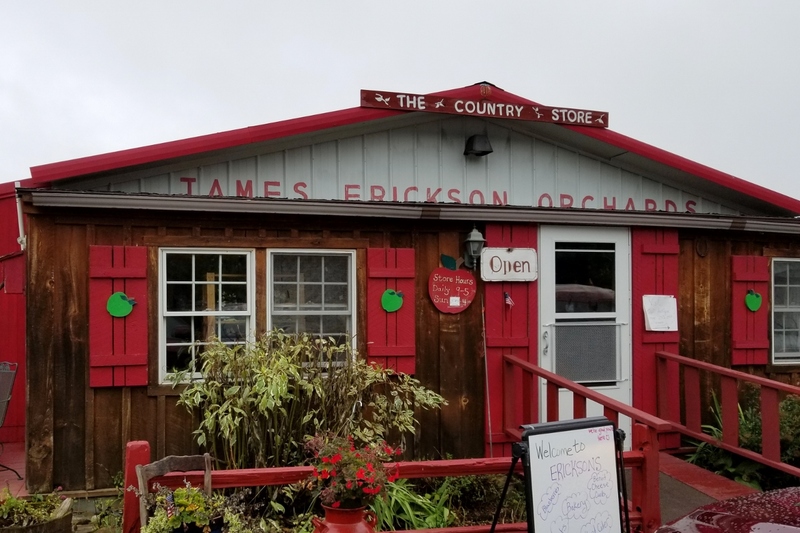 You may be surprised to find out that there is a micro-climate near Lake Superior and the Apostle Islands that produces some of the best tasting apples and juiciest fruit around. 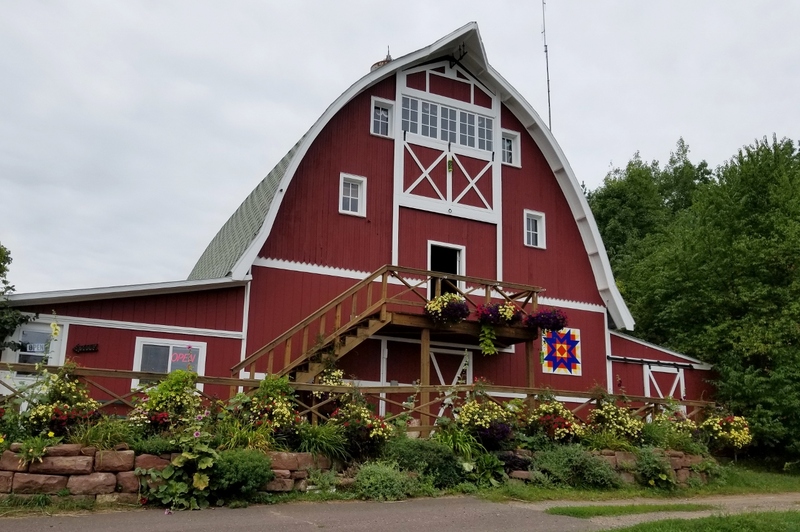 Bayfield, Wisconsin is a starting point for a popular self guided tour that takes you to sixteen of the farms, orchards, and wineries that produce all of this delicious fruit. This tour is called the Bayfield Fruit Loop, and it’s a fun way for the whole family to spend a day. Each stop on the tour is unique in it’s offerings. Some places are a small shed selling apples, and some are year-round shops selling much more than fruit. To get a map and more information about the farms and orchards, just click here. There are also updated orchard and berry reports on the Bayfield website. I hear that 2018 is a great year for apples. We were on the fruit loop the very end of August, and a few locations weren’t open yet. Usually everyone who sells apples is open by mid-September. Some farms that just offer berries will be open in June and end their season by mid September. 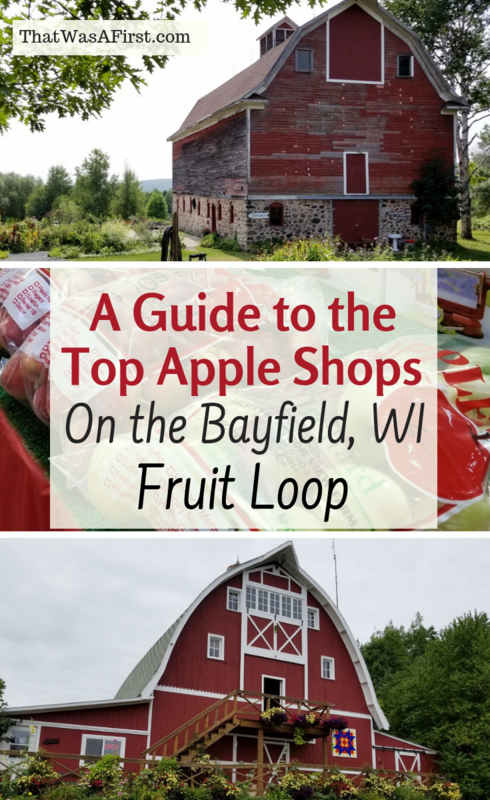 Bayfield is known for their apples, and apples are what you’ll find at a lot of the stops on the Bayfield Fruit Loop. Besides the apples, you can buy almost every kind of berry imaginable, when in season. Berry offerings are; strawberries, juneberries, raspberries, gooseberries, blueberries, and blackberries. Other fruits on the loop are grapes, cherries, pears and plums. Wow, what a variety of fruit! We stopped at five locations on the Bayfield Fruit Loop, and I’ll highlight what was unique about each one below. 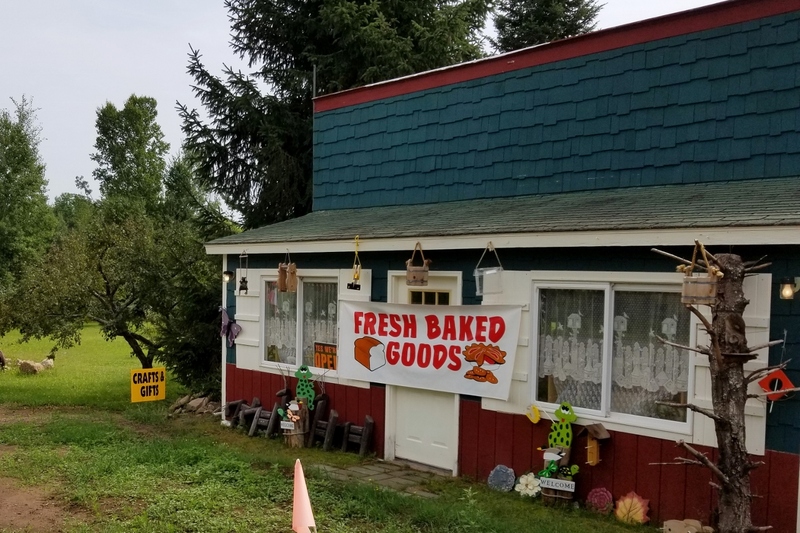 We were on the hunt for baked goods for the next morning’s breakfast, and we found all sorts of goodies at Erickson’s Orchard and Country Store. Our most important purchase was the apple cider donuts. They are so good! When the employee opened up the donut case, we were hit with the scent of delicious and sweet apple cider donuts. I almost asked her to close the case just so she could open it again for us to smell the donuts. Can you smell the apple cider donuts? I was looking at an unusual item in the bakery case, and was told it was an apple pie stick. How could we resist trying something new? The apple pie stick was a flour tortilla rolled up tight with apple pie filling stuffed inside. It was covered in cinnamon and sugar and very crispy. We completed our purchases with a loaf of blueberry bread and some pumpkin cookies. I have to admit this wasn’t the first apple shop that we’ve gone too and didn’t buy any apples. 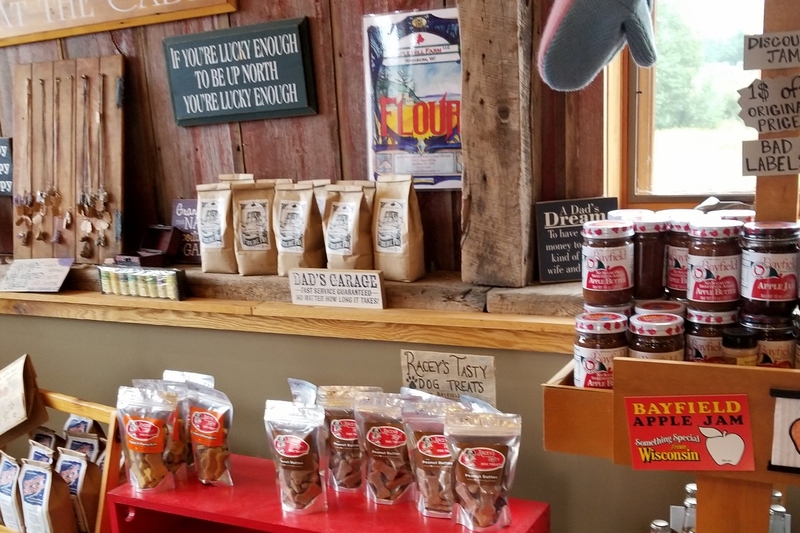 Erickson’s Orchard and Country Store was packed with apple goodies, jams, and home decor. If you love hunting for antiques, Erickson’s has the Log Cabin Antique Shop right next door. Plus in the early summer, they sell annuals and have garden accessories for sale. So much more than apples! This shop has everything apple! They sell apple jams, jellies, cider, hard cider, mustard, syrup, honey, and so much more! We walked in the door, and the kids made a beeline for the samples and I was able to take my time shopping. The Bayfield Apple Company sells their own products, but also a wide variety of locally made items. It’s always fun to shop and recognize some products “from home”. Apple this, and apple that! 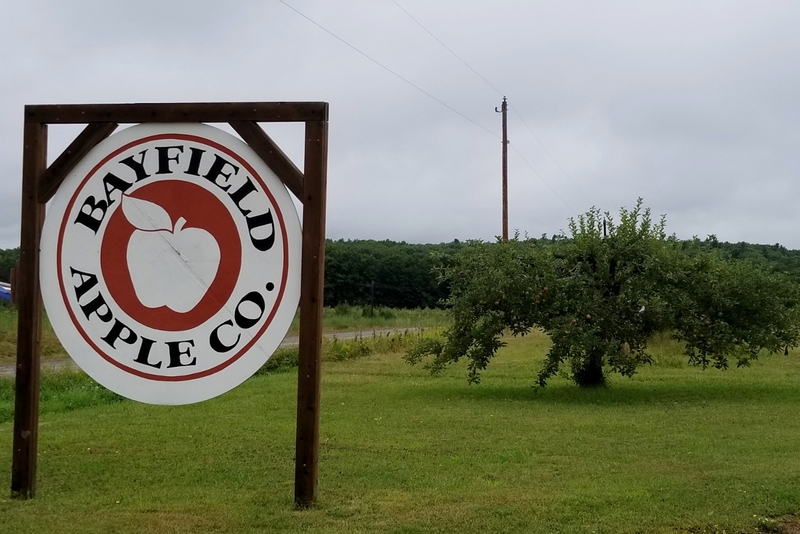 The name of the Bayfield Apple Company is a little misleading because they also grow pears, blueberries, raspberries, peaches, currants and cherries. All organically managed too. The Bayfield Apple Company produces their very own hard apple cider that you can only buy at their orchard store. So, I bought some! Drink some of their hard cider and you’ll be tasting a combination of their 17 varieties of apples hand pressed in their cider house. You can’t beat shopping local here! Don’t forget to get a picture of the apple orchard! This stop on the fruit loop was our absolute favorite! 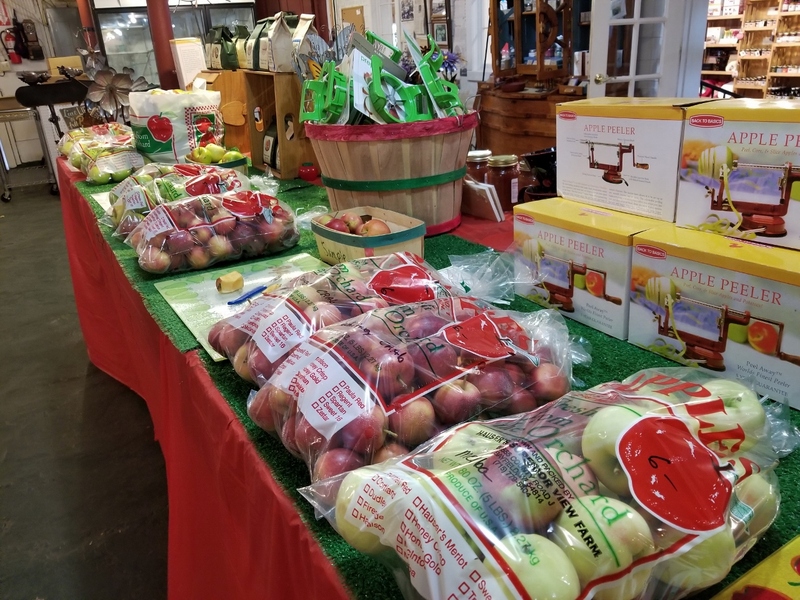 We were there in the very beginning of apple season, and Hauser’s Superior View Farm already had apples available to sample! I hadn’t heard of some of the apples they had out, and was told they grow some old varieties of apples that many people don’t grow anymore. How unique, and it was fun for us to try something new! The gift shop is full of apple goodies, home decor, and kitchen gadgets. You can also see into the room where they sort and process the apples. It is a pretty neat place, but the best part was upstairs. 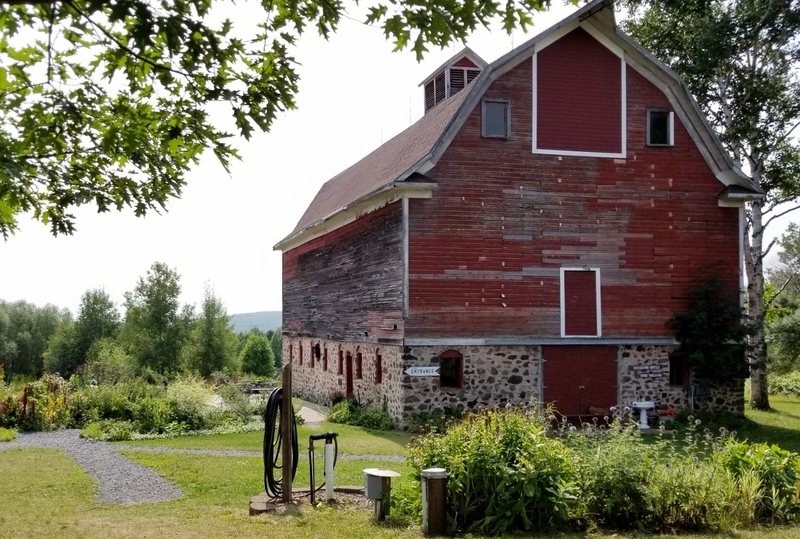 The barn is three levels, and you don’t want to miss any of them! The Orchard Shoppe at Hillcrest Orchard was a fun little stop. My youngest is still talking about the monster cookie that she bought here. Besides giant soft cookies, Hillcrest sells homemade pies and other baked goods. We like places like that! They sell baked goods! Enough said! 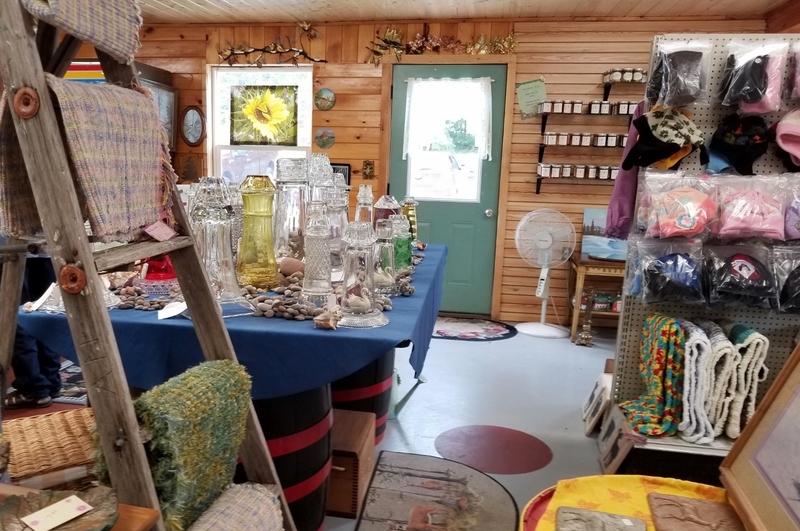 Besides selling all things apple, the Orchard Shoppe had a lot of collectibles, antiques, and locally made products throughout the store. It was a little crowded with the few people who were in there with us, and I can’t imagine how busy they are during the Bayfield Apple Festival weekend. Not just an apple shop…. I saved the prettiest farm for last! The Blue Vista Farm looked like something out of a movie when we stopped in August. The flower gardens were beautiful, and the bright sunny day provided the perfect backdrop to this old farm. Take the time to wander through the flower gardens! The flower gardens were full of color, but it was the blueberry field that was getting all of the attention while we were there. 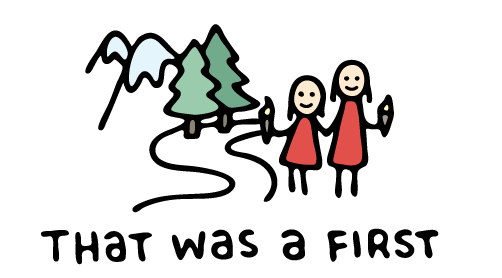 You can pick your own berries, and a lot of people were doing just that. Inside the barn, is the gift shop. Blue Vista was featuring a lot of locally made gift items and home decor in August. They had frozen berries and apple cider in their large freezer case, and both are sold year round. The gift shop was pretty big, and I imagine it will be full of apples in the midst of apple season! 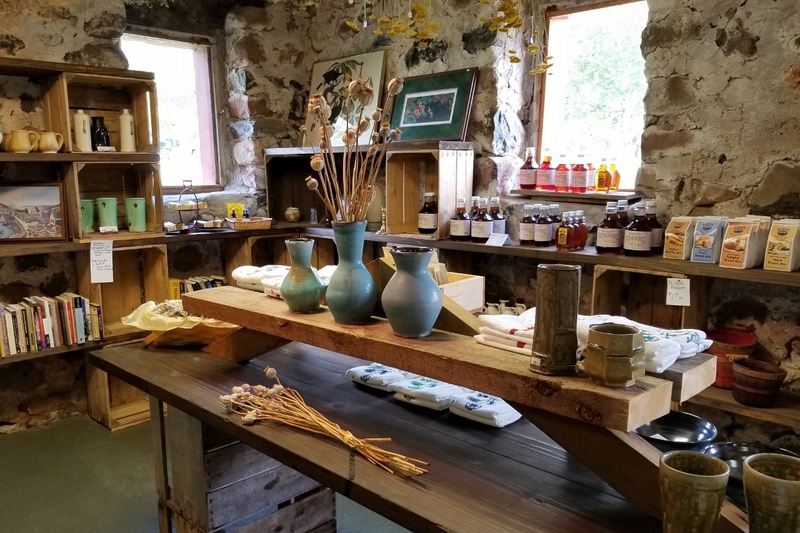 A peek inside the Blue Vista Farm gift shop. After wandering the grounds at the Blue Vista Farm, my oldest commented that it felt like we were in Europe! Everything here was just so pretty! Every stop along the Bayfield Fruit Loop is unique and not to be missed during the short apple season. The sixteen stops are within close proximity to each other, and it’s an easy tour to do. Just follow the map, and the signs at every turn, and you’ll stay on track. While I’ve only highlighted five stops, add your comments below about the others. 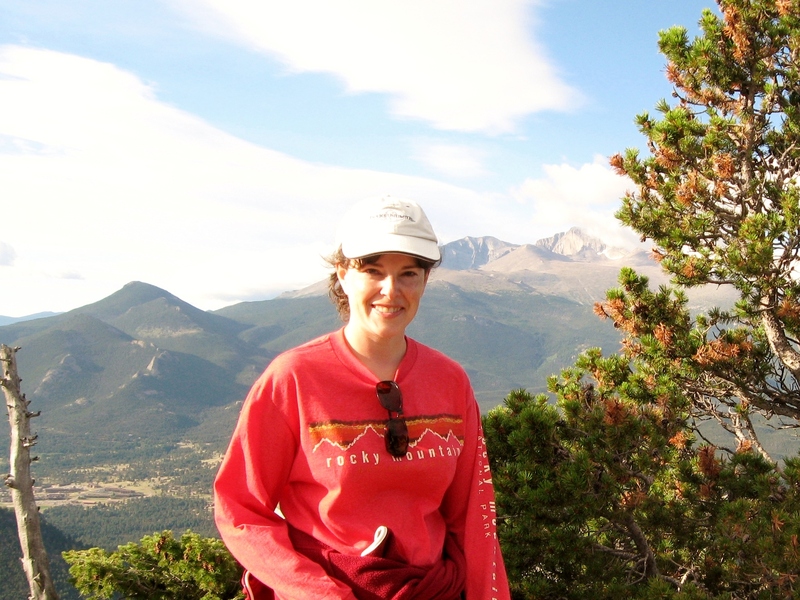 One of our favorite campgrounds is nearby. Read about Little Sand Bay here. Follow my Wisconsin – Family Travels Pinterest board for more Wisconsin fun. Passing thru Hayward on your way to Bayfield? Here are 9 reasons your kids will love Hayward.